The retina lines the back wall of the eye, and is responsible for absorbing the light that enters the eye and converting it into an electrical signal that is sent to the brain via the optic nerve, allowing you to see. Many conditions can lead to a retinal detachment, in which the retina separates from the back wall of the eye, like wallpaper peeling off a wall. 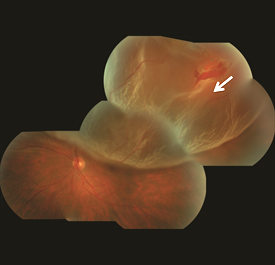 Superior macula-involving retinal detachment with a retinal tear identified with arrow. Same patient one day after treatment. The retina is reattached and a gas bubble is visible at the top of the eye. When the retina is detached from the back wall of the eye, it is separated from its blood supply and no longer functions properly. The typical symptoms of a retinal detachment include floaters, flashing lights, and a shadow or curtain in the peripheral (noncentral) vision that can be stationary (non-moving) or progress toward, and involve, the center of vision. In other cases of retinal detachment, patients may not be aware of any changes in their vision. The severity of the symptoms is often related to the extent of the detachment. In general, retinal detachments can be categorized based on the cause of the detachment: rhegmatogenous, tractional, or exudative. Rhegmatogenous (reg ma TODGE uh nus) retinal detachments are the most common type. They are caused by a hole or tear in the retina that allows fluid to pass through and collect underneath the retina, detaching it from its underlying blood supply. Retinal tears can develop when the vitreous gel separates from the retina as part of aging or in patients with abnormal thinning in the peripheral retina (known as lattice degeneration) or occasionally from trauma. Tractional retinal detachments are caused by scar tissue that grows on the surface of the retina and pulls the retina off the back wall of the eye. This type of retinal detachment may occur from diabetes or other conditions. Exudative (ex OO day tive) retinal detachments form when fluid leaks out of blood vessels and accumulates under the retina. 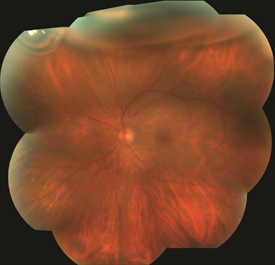 This type of retinal detachment is much less common and can occur in eyes with abnormal inflammation or excessive leakage from abnormal blood vessels. Your retina specialist will perform a detailed eye exam, including a careful examination of the peripheral retina. This may include pushing on the outside of the eye (scleral depression) to view the far most peripheral retina to identify any retinal breaks that will need to be treated. Photographing the retina is sometimes performed to document the extent of the detached retina, and an optical coherence tomography (OCT) scan of the retina can be useful to determine whether fluid has detached the center of the retina (the macula). When a clear view of the retina cannot be obtained by direct visualization, an ultrasound of the eye can be helpful. Scleral Buckle — In this surgery, a silicone band is placed outside the eye wall to push the wall of the eye closer to the retinal tear in order to close the tear. The tear is treated with a freezing treatment to induce controlled scarring around the tear and permanently seal it. The fluid under the retina is sometimes removed at the time of surgery. Vitrectomy — In this surgery, three small incisions are made in the white part of the eye and fine instruments are manipulated using an operating microscope to remove the vitreous gel that fills the eye and drain the fluid from under the retina. The surgeon may then use a laser or cryopexy to seal the retinal tears or holes. The eye is then filled with a gas bubble to hold the retina in place while it heals. Pneumatic Retinopexy — In this office-based procedure, a gas bubble is injected into the eye and the patient maintains a specific head posture to position the gas bubble over the retinal tear. The tear itself is sealed either with a freezing treatment at the time of the procedure, or with laser after the retina is re-attached. Laser Surgery — In certain cases, a retinal detachment can be walled off with laser to prevent the retinal detachment from spreading. This is generally appropriate for small detachments. Based on the characteristics of the detachment, a retina specialist can determine which approach is most suitable. In general, retinal detachment repairs succeed in about 9 out of 10 cases, though sometimes more than one procedure is required to successfully put the retina back into place. The visual results depend on each patient’s pre-operative vision and other factors that differ between individual patients. In general, when the center of the retina has not detached before surgery, the post-operative vision tends to be similar to the pre-operative vision. If the central retina is detached prior to surgery, successful re-attachment often leads to vision improvement, though some degree of permanent vision loss may occur.